Place ingredients in salad dressing shaker. Be sure to measure the oil and then the honey, using the same measuring spoon. The oil coating on the spoon will allow the honey to easily slide off spoon. Kiwi may look unappetizing at first glance, but under that hairy brown exterior lays a bright green flesh speckled with tiny black seeds. Many find the taste and texture similar to a strawberry. The kiwifruit is native to the Yangtze River valley of northern China and Zhejiang Province on the coast of eastern China. Originally known as the Chinese gooseberry, it was used as a tonic for children and women after childbirth due to its high nutritional value, but never truly enjoyed it as a fruit in China. The first seeds were brought out of China by missionaries to New Zealand at the turn of the twentieth century. The kiwi is a small oval shaped fruit approximately 3 inches long and weighing about four ounces. When purchasing, select kiwi that are unblemished and firm but not rock hard. The flesh should yield to gentle hand pressure. Avoid those that are shriveled, moldy or have soft spots. You can easily ripen kiwi by leaving it at room temperature for a few days or to speed up the process, put the kiwi in a dry paper bag along with a ripe apple or banana. You can also enjoy the skin which is very thin like a Bosc pear and full of nutrients and fiber; the peach like fuzz can be rubbed off before eating. 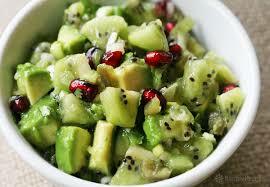 However, most people prefer to peel kiwi fruit or slice in half and scoop out the flesh with a spoon. Kiwifruits are low in fat and calories and have no cholesterol. They are loaded with Vitamin C, potassium and fiber and add great color and tropical flavor to your salads. If you are adding kiwi to a salad, you should do so at the last minute so as to prevent the other fruits from becoming too soggy.